Every once in a while, I get really excited about getting in shape. I’m not sure if I’m the only person who is like this, but these moments of fleeting, fitness inspirations strike somewhat like a summer thunderstorm; you know those days when a seemingly, sunny, day suddenly transforms into a raging, energetic, tempest, only to resign itself within the hour to a seemingly, serene, sunset? This, sadly, has been the pattern of my fitness regimes. During one of these so-called fitness seasons, I purchased a valeo balance board. My intentions were to use it in my daily work-outs, but seeing my work-outs have historically lacked the general commitment of daily? For the past several months (ok, a couple years) my balance board has remained in a dust bunny, scrod of shame in my closet. However, while looking for a suitcase during my most recent travels, I discovered the board, and moved it out of my closet in order to reach other things. In a move that screams organization-pro, I didn’t return it to the closet… and thus, for the last month, it’s now taken to sitting in my bedroom for occasional moments of diversion, but mostly a means of entertainment for my five-year-old nephew, when he pays me a visit. On one of his recent visits to my bedroom, after entertaining himself doing a multitude of actives that I absolutely approve of (like jumping off my bed, and pulling on my curtains…) he moved on to my balance board for a while. Finally, I decided it was time to divert our path to destruction vivacious five-year-old energies to another room, so we made our way to the kitchen. As we were walking, he said, “Auntie M? 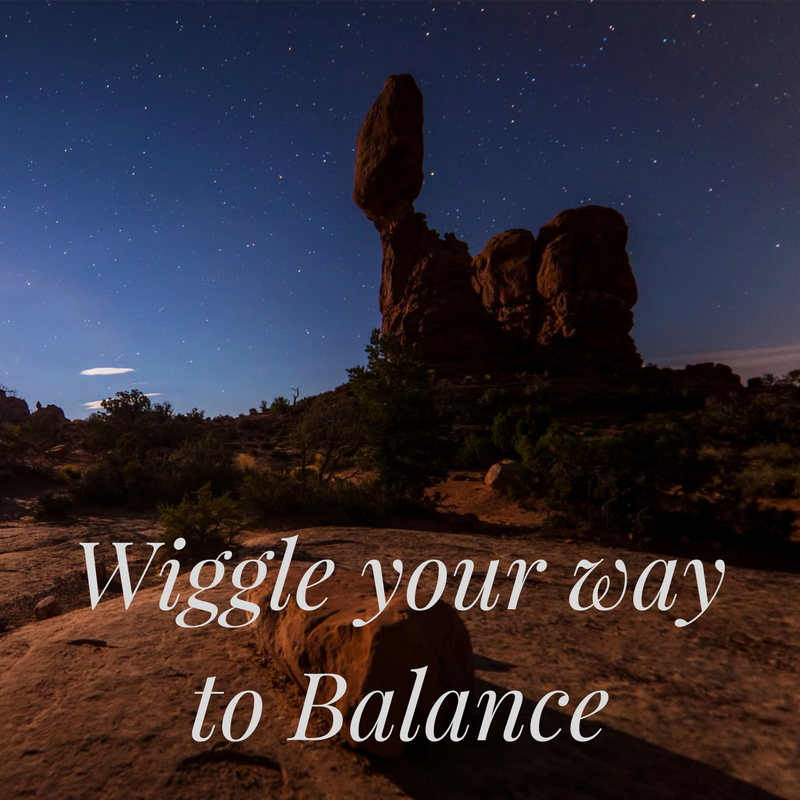 You have to wiggle to balance.” Thinking this an oxymoron I started to chuckle, (because obviously, wiggling is the opposite of balancing…right?) But then I realized from his serious five-year-old face, that he was being absolutely serious. And it was about that time that I realized… he was actually quite right. When I think about balance, I usually think about rocks. The picture that comes to my mind is that serene imagine of stones stacked on top of each other, with the bottom stone being the largest, and they get smaller, and smaller, as they reach the top. You know the picture I’m thinking of, yes? A lot of us are interested in cultivating a balanced life. I know that’s something I’m interested in. We want the intersections between work and love, and family and friends, to stack up neatly like the rocks in the picture. Here’s the problem… humans aren’t rocks. I think much of our frustration in finding balance in life stems from us approaching the situation as though we were expecting everything to behave statically, instead of seeking to wiggle strategically. The reality is, living beings don’t really work statically. Everything in our body is constantly adjusting to external stimuli; one of the principle concepts in studying biology is how living things are constantly working to create homeostasis… that’s the fancy biological term for, you guessed it, balance. Too much oxygen, or too little oxygen? And we die. Too much water, or too little water? And again… we die. Too much sodium, too little sodium? Yep… again, death. Balance or homeostasis, is biologically crucial to life, but it’s not an arrival state, it’s a constant process of molecular wiggling. So how do you strategically wiggle? Here’s a few steps that help me wiggle towards balance. Scientifically note your appetites. Our bodies are really good at signaling when we need something. We have multiple hormones that alert us when we’re low on energy (we call this hunger) or when we’re thirsty, or too hot…or too cold. Most of us become pretty good at reading those signals, or appetites. Sometimes we’re not as good at reading more subtle signals. As an introvert, I love people? But I have to monitor my time with people, because too much time leaves me withdrawn. I think one of the ways to become more balanced is to note (without judgement) what we need to bring our best self to the world. Do you feel better with more or less sleep? How do you feel when you take time for exercise? Or when you spend time being alone? What happens when you don’t make that time? This part of wiggling isn’t about judging, it’s just about noticing. When I have this, I feel this way. When I don’t have that? I feel this way. Know your terrain. Once you are aware of what your appetites are? Then you can start putting them in the context of your life. Staying hydrated in the dessert is going to take a little more wiggling than staying hydrated in a rain forest. Getting enough rest when you’re a new parents is going to take significantly more strategy than getting enough rest when you’re living alone. Your life is individual, and part of being in balance is going to mean applying your needs into the context of your terrain. Rest & Reflect. Most of the time, the terrain of our lives shifts from time to time, and so this process has to be readjusted again and again. This is why rest and reflection are so important to staying balanced. Commit time to reevaluate …this could be setting aside time every week, or month… or quarter. But ideally, this happens several times throughout the year. For me right now, being in a school that operates on the quarter system, the quarter provides an ideal structure for me to reconsider goals, and wiggle my way back into personal homeostasis. Based on the terrain of your life, this will look different for each person. As a graduate student, I frequently find myself wearing a lot of hats. But I would error greatly if I thought I’m the only one who feels overwhelmed. I’m a long shot from being the only person, in fact many of my friends who are working, and trying to also be caregivers, feel this pressure deeply in a way I only partly relate to. Balance is something that sounds awesome, but this week I’m thankful for the reminder that I’m not aiming at a static statuesque perfection of balance. When I’m feeling out of balance, I just need to remember–this is my body’s way of reminding me I’m a living being, not a rock–wiggling is part of the process.